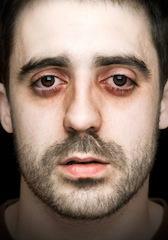 Fatal insomnia (FI) is a very rare disease that interferes with normal sleep cycles, causing the patient to stay awake. The deadly condition causes motor skills and mental function to deteriorate, and eventually the patient dies. Fatal insomnia is a prion disease that leads to degeneration in neurons. This group of illnesses can affect animals and humans. One of the most well-known is bovine spongiform encepalopathy (mad cow disease), which is on the Center for Disease Control and Prevention's list of prion diseases. A prion is an infectious protein that may cause degenerative diseases in the nervous system. The family of diseases cause degeneration in neurons, and they cause the body to fail to create inflammatory responses. Another term for prion diseases is transmissible spongiform encephalopathies (TSE). Fatal familial insomnia (FFI) is an inherited form of the sleep disorder that stems from a specific gene mutation. Sporadic fatal insomnia occurs without a genetic mutation, and it is not inherited. Some of the symptoms of FI weave into four stages. During the first stage of the disease, the patient experiences increasing insomnia. The lack of sleep leads to other problems including panic attacks, paranoid behavior, and phobias. In the next stage, the patient experiences hallucinations that intensify panic and phobic responses. The third stage of the disease leads to quick weight loss, and the absolute inability to sleep. In the forth and final stage of the disease, the patient becomes unresponsive and/or fails to speak. Dementia is present in the forth stage as well. People with a family history of the disease are at increased risk of developing the rare condition. A doctor may consider a diagnosis of FI if the person has a family history, motor problems and/or severe insomnia. A genetic test can confirm a suspicion of fatal insomnia. The interventions may extend and improve the patient's life, but they do not prevent death. The prognosis is bleak for patients with FI since death occurs in about 13 months, on average. How long can someone live without sleep? Researchers estimate that a person can live without sleep for about 11 days before expiring. The challenge is that it is impossible to conduct an ethical experiment that would answer the question undoubtably. Fatal insomnia offers clues as to length of time it takes before a person dies from lack of sleep. The problem lies in the fact that the actual cause of death in FI is unknown. Sleep is important, and even short-term sleep deprivation can be very uncomfortable. When a person's inability to fall asleep continues without waning, it can be unbearable. More research into treating the deadly disease may lead to a solution one day.